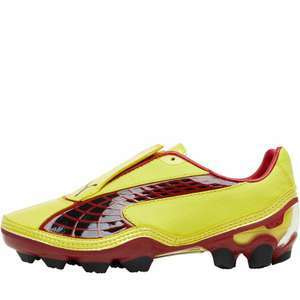 Puma firm ground football boots featuring covered laces for a smooth kicking zone and strategically placed blades for power and stability. Textile and synthetic upper.Textile and synthetic lining. Injected TPU in the heel wedge for the lightest weight stability platform. Bladed cleats provide grip and stability without added excess weight. Wow, they still sell these? From the era of boots where adding curves to them like a sports car would make you think you can run faster. Get them for ya kid if they like to get bullied. Looks pretty good value to me, as for bullying, due to the fact all players seem wear garish colours my nephew wants bright colours and brand, everything is irrelevant. Everyone knows predators are best boots the world has ever seen!